West Roxbury, Mass. -- As the MIAA regular season begins to wind down, St. John’s Prep showed on Saturday it has the whole package. Aise Pream ran for 138 yards and three total touchdowns while Wes Rockett reeled in nine receptions and a touchdown as No. 4 St. John’s Prep defeated No. 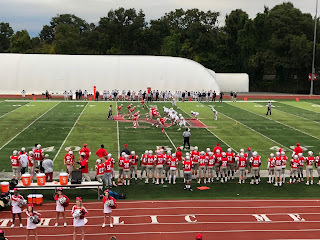 5 Catholic Memorial, 27-20, on Saturday afternoon at Jim O’Connor Field. The Eagles’ defensive line wreaked havoc throughout the game, consistently putting pressure on Catholic Memorial quarterback Barrett Pratt and often hitting him as he threw. Defensive tackles Cooper Smith and James Taylor led the charge while Jackson Delaney provided pressure off the edge. Rockett and Pream also showcased their talents on the defensive side of the ball, with Rockett playing tight coverage for most of the day and Pream corralling an interception. In all, St. John’s Prep (4-1) picked off three of Pratt's passes. Trailing 20-3 to begin the second half, the Knights began the slow charge back courtesy of their defense. On St. John’s Prep’s third play to begin the half, Catholic Memorial forced a fumble that was scooped up by Hunter Tully and taken the distance the other way for a 37-yard score to pull the Knights within 20-10. 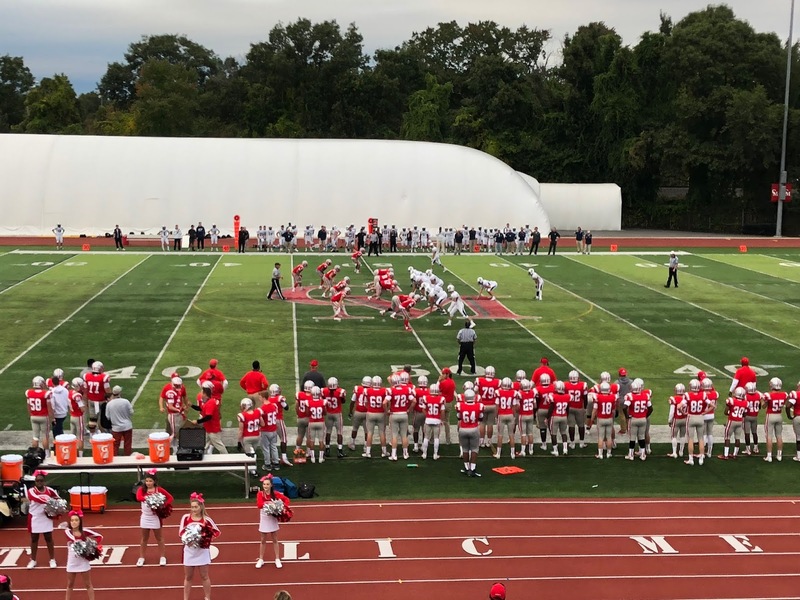 St. John’s Prep looked to add to its lead on its next possession when it drove into Knights territory, but Devon Williams intercepted Matt Crowley’s pass and returned it to the Eagles’ 22-yard line. After a holding penalty pushed the Knights back, the Eagles defense held on third and four tackling Spencer Aronson after a gain of just one forcing a Matt Sokol 32 yard field goal that trimmed the CM deficit to 20-13. The Knights had one lone chance to even the score after a forcing a Prep punt, but went three and out turning the ball back over St. John’s. That’s when Rockett took over. On the ensuing CM punt, Rockett corralled the ball off a bounce and took off down the left sideline for 39 yards before being brought down inside the red-zone. Two plays later, Crowley connected with Rockett on a perfectly thrown ball off a fade route for a 22-yard touchdown to give St. John’s Prep a 27-13 lead. Catholic Memorial pulled within a score on a Jamall Griffin one-yard touchdown run, but the Eagles recovered the onside kick to seal the win. The Eagles struck first on their opening play from scrimmage as Crowley connected with Pream on a wheel route for a 47-yard touchdown to put St. John’s on top 7-0. St. John’s Prep’s defense quickly made its presence felt. On the Knights ensuing drive, Tripp Clark picked off a Pratt pass setting the Prep up deep in opponent territory. After a pair of Crowley passes to Rockett got the Eagles down to the seven-yard line, Pream took the direct snap, rolled right as if looking to throw, before evading pressure and running it in himself for a touchdown to give St. John’s a 14-0 lead. The most impressive drive of the afternoon began late in first quarter. Catholic Memorial looked bound to put its first points on the board, but Pratt threw a wobbly pass after facing pressure that was intercepted by Antael Rosa to give the Eagles possession at their own 4-yard line. St. John’s proceeded to go on a 21-play drive that took over 10 minutes off the clock. The key play of the drive was a fourth down and three conversion from Crowley to Rocektt before Pream rushed in a seven-yard score to give the Eagles a commanding 20-0 lead.